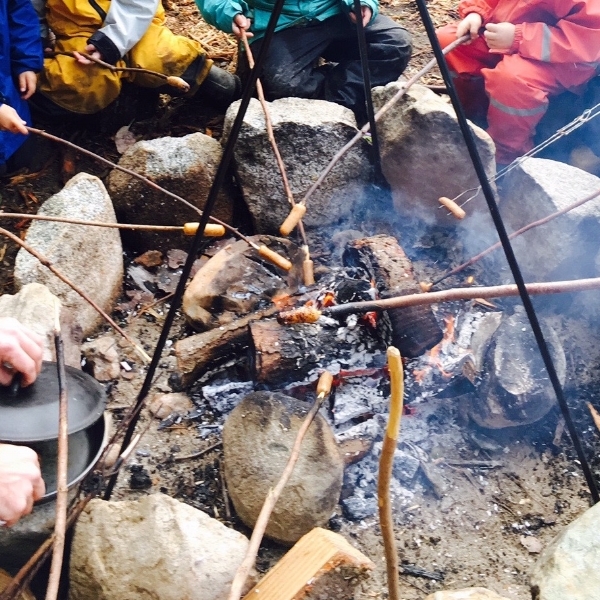 Our blog shares some of what is unique and wonderful about Madrona School and the worldwide Waldorf education movement. 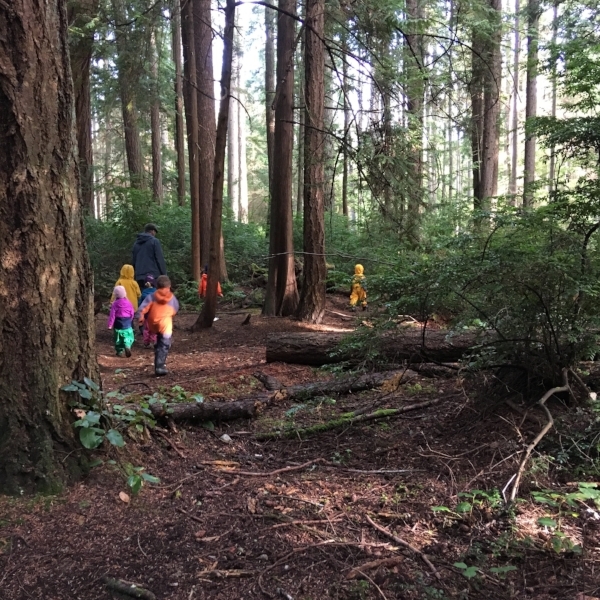 Madrona School is an independent, private school on Bainbridge Island (WA) offering Waldorf education for children ages 18 months - 14 years. We have parent-child classes, play - based preschool, nature - intensive kindergarten, and grade school classes. Our grade school offers arts - infused academics for 1st - 8th grades. We are located a ferry ride away from Seattle, WA in Kitsap County. Find out why Waldorf education is a time-tested alternative educational methodology. 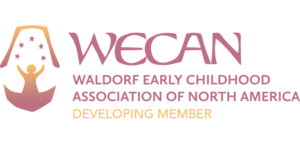 This year, we plan to highlight each of our early childhood classes and grades in our weekly school newsletter -- a chance for parents and our broader community to glimpse inside each classroom. First up, kindergarten! The morning begins outdoors even on days when the class is not up at Lowery Farm, and when the children arrive, they need to prepare for the day. The children look to see how Sally Sunshine dressed for the morning's weather...Does Sally have rainboots on? Then we will put ours on too! Opportunity for play is at the core of what we offer in kindergarten -- a chance for imaginations and bodies to grow and develop. Play lays a foundation for executive functioning and creative, flexible thinking. The kindergarten play is varied and vigorous and ever changing. In free lay, some children watch for a bit, some ask a teacher to turn a jump rope or get out the whittling knives, while others are off and planning games that can go on for many days. In one recent game, pine needles became both gold and hay, and many wheelbarrow and wagon loads were happily transported around the yard. In another game, climbing led to both roosters crowing and pterodactyls crying at the top of the sandbox structure. We offer structured group play options too, with bread baking, painting, woodworking and walks, all opportunities to gather together for an activity. Walks, for example, offer a chance to explore beyond the school grounds and strengthen and integrate young bodies. Both classes visit the Ted Olson Nature Preserve, just up the road from Lowery Farm. The paths, fairy houses, fallen logs and towering trees offer infinite fodder for further play! 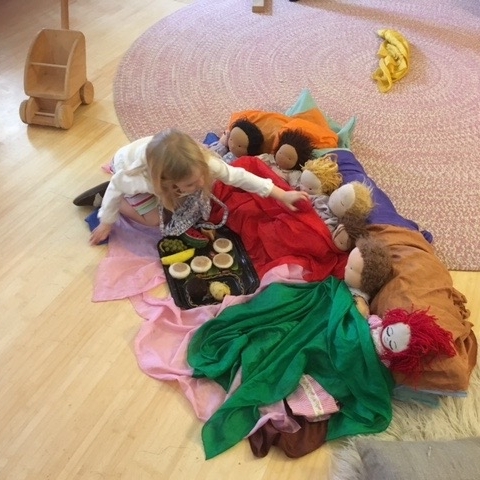 Interspersed with periods of play and exploration, the class comes together -- for circle time, for snack and for story. Children delight in learning songs, poems, games and in hearing stories. Teachers know that the children are developing literacy with comprehension practice and inner picture work, as well as developing their attention spans too. A nourishing kindergarten experience also includes nutrition. 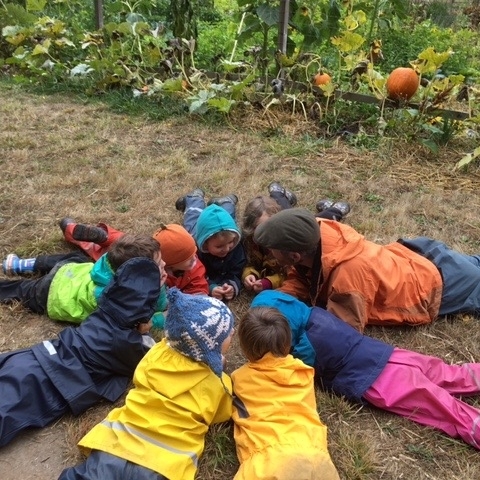 And, from mousie treats of seeds and fruit, to huckleberries picked high off the bush by a helpful teacher, to gathering around the table together for warm, organic food and conversation, there are many opportunities for good food in kindergarten! By the end of the morning, a kindergartener has rosy cheeks from time spent outdoors, time immersed in imaginative play, joy in singing and games, and wholesome food. They are engaged with their classmates and teachers too. These kindergarten rhythms are laying a sturdy foundation for the academic learning to come, and it is just so much fun! 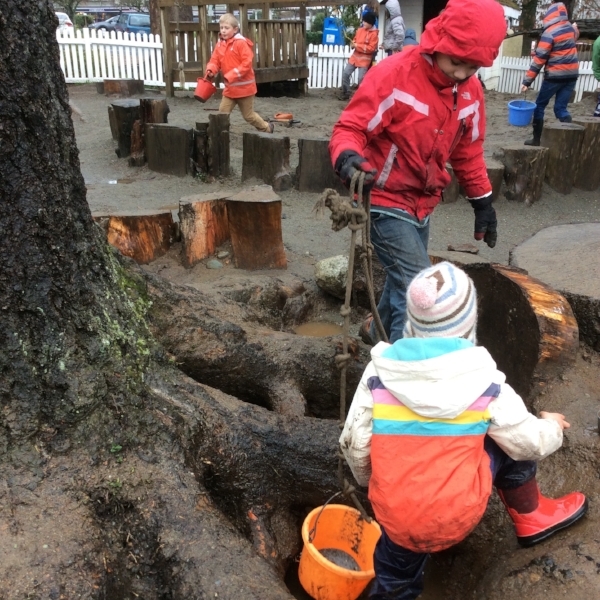 Some of you might have noticed the digging project that the kindergarteners began, several weeks ago, around the roots of the old Douglas Fir stump on the play yard. The project grew from a simple question, "I wonder if we could tunnel under that root?" "Hmm... I wonder..." was the reply. The curiosity was contagious and the picks and shovels have been busy ever since. Now, I'll be the first to acknowledge my own enthusiasm for the project. I too wonder what might lie buried below. (In fact, I forget who posed the original question, and suspect that it could have come from me.) Fortunately for big projects such as this, enthusiasm is contagious and the children will come and go throughout the course of any morning. Some will jump into the holes and move the earth right alongside me. Others will help push and pull a wagonload of dirt from here to there. Still others come to step and leap from root to root, observing the progress and creating their own imaginations. However, once the work is underway, I like to take a step back and spend a moment observing (with wonder) the many layers of work going on around me. The children moving the earth with shovels and hands are meeting a variety of resistances as they tunnel through dirt, sand, rock and clay. Their developing proprioceptive system is being stimulated and strengthened with every scoop. Others crawl beneath roots and squeeze through narrow openings. The nerve endings concentrated in the joints receive input from these gross motor activities (like shoveling, pushing, pulling, carrying heavy objects, etc...) that gradually builds an internal map of one's body in space. They are discovering themselves by coming up against the earth. I see that some of the children try to avoid touching the mud or dirt or sand with their bare hands. I make note that they may be more touch sensitive than their peers, and I try to find opportunities to introduce new sensory input to these children and encourage them to play in a way to help them integrate this developing sense. 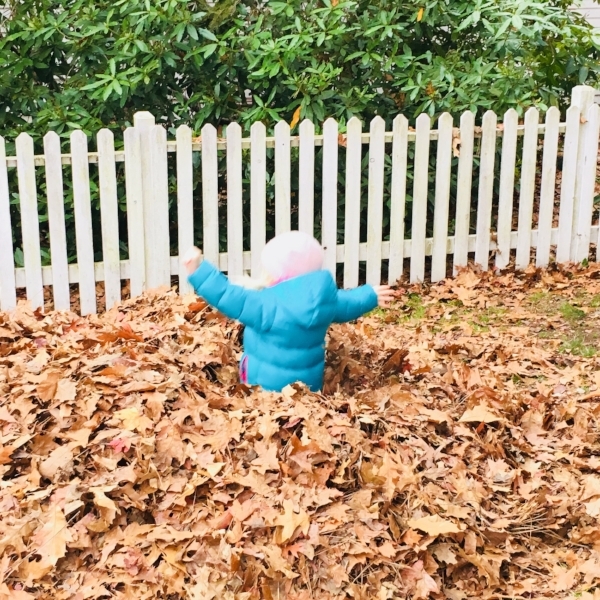 The children who are balancing on the latticework of exposed roots are strengthening their core muscles as they work to stay upright, as well as working the vestibular system of the inner ear. Others are hanging upside down or reclining in a hollow. As the fluid of the inner ear sloshes back and forth with the movement of the head (especially upside down! ), there is again the gradual inner mapping of the spatial planes and the body's relationship with them (front, back, side to side, up and down). Having these activities available for the young child is important for their developing sense of balance and sense of movement. Of course, the children care nothing for such adult talk. They instead are pirates, ninjas, otters, cats, birds, princesses and knights. They are making homes and forming relationships and discovering more mystery in the ordinary than we could ever imagine. Together, the children and I, vigilantly watch each shovelful of dirt and rock for unearthed treasure. We wonder how deep we can dig, how much earth we can move, and if anyone will fit between the roots we have exposed. The fun is in the wondering of the question and in the application of the will to try to answer that question. 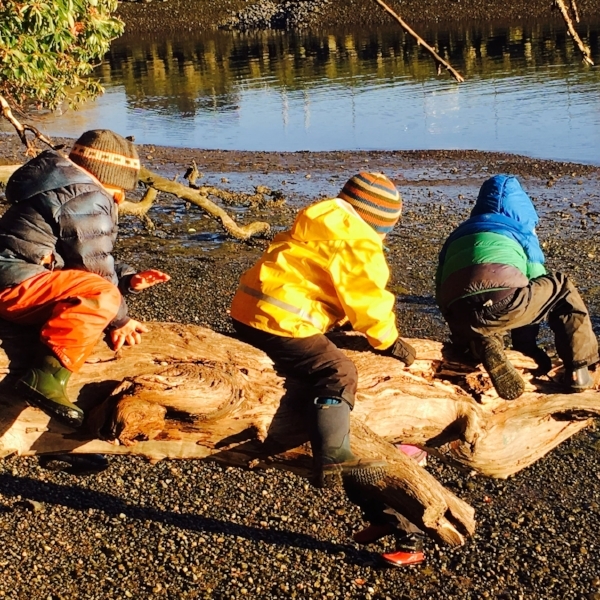 What began as a Salmonberry kindergarten project, has captured the imaginations and will of children of all ages!